Typically, you’ll need two parts to your cloth diapering system – the absorbent diaper, and the waterproof cover. The original flat diapers are one-layer, generally made out of 100% cotton gauze and are the most “old- fashioned” choice. These days, there are many other options, including hemp and bamboo, sometimes in multiple layers. I briefly tried diapering with cotton flats, but they just aren’t absorbent enough. However, they are great as burp cloths and general house cleaning. I did use heavyweight, 2-layer hemp diapers as stuffers in pocket diapers for nighttime. These were absolutely great — super absorbent and hardworking. The advantages are that they dry extremely quickly and fit a large range of size. The disadvantages of the older style flat diapers are the folding and pinning that are required, as well as lower absorbency. Newer flat diapers in more absorbent materials can be used as stuffers for pocket diapers. These used to be one of the most popular options. They are similar to flats, but have multiple layers with more layering in the middle. They are referred to as 2x6x2’s, 4x6x4’s, 4x8x4’s etc. These numbers refer to the number of layers in the sides and middle of the diaper (i.e., 4x6x4’s have 4 layers in the sides and 6 in the middle). The Gerber diapers you see at Target and Walmart are prefolds, but they aren’t nearly as absorbent as the Diaper Service Quality (DSQ) Chinese prefolds (CPF’s) you can buy on-line. Prefolds come in bleached or unbleached cotton (abbreviated as BCPF or UBCPF). I’ve always gotten unbleached because I like the off- white color, they hide stains better, and I’ve heard that they’re softer. Prefolds need to be pinned, snappi’ed, or folded into a trim fitting wrap-style cover. In addition to cotton, prefolds can be found in hemp and bamboo as well. They come on a multitude of sizes from preemie to toddler. The stitching on the edges of the prefolds are usually coded to tell you the size (for example, dark green = infant, white = regular, dark blue = premium). I used regular and premium sizes on my toddlers. The regulars are very trim and are great during the day. The premiums are quite a bit larger and thicker, but are good for naps and nighttime. I started out by pinning my prefolds, but ended up tri-folding them because it was faster and kept wetness off of my babies’ waists. Prefolds store easily, dry quickly, fit a wide range of body types and sizes, don’t have elastic/snaps/velcro to wear out and are very absorbent. Prefolds need a separate cover and need to be fastened or folded and laid in a wrap. This is one of the most popular options. Fitted diapers have elastic at the legs and back and basically look like a disposable diaper (only much cuter, of course). They can have velcro or snap fasteners, plain or printed outers, and can be made from a variety of materials like organic cotton or hemp. There is a huge number of women making diapers from their homes catering to any size, shape, wetting ability, etc. of your child. They are often referred to as work-at-home-moms (WAHM’s), although some have expanded to keep up with production. Makers of fitteds usually give size ranges based on weight. You might have to experiment to find a fitted diaper that fits your baby well. Some sellers also offer one-sized options that use snaps to fit from newborn to toddler. I tried a few fitteds, but generally found that I preferred prefolds. I did use newborn Kissaluvs to help with containing breastfeeding poops, but honestly, still found prefolds my go-to option. Fitteds are adorable. They come in a wide range of prints. Most are so absorbent that your baby / toddler can wear them without a cover if you’re hanging out at home. The elastic at the legs keep things contained. They don’t need separate fasteners so are easy enough for babysitters and day-care providers to use. Because of their thickness, fitteds can be hard to wash thoroughly and can take a while to dry. They also have snaps, elastics, and velcro that can wear out over time. All-in-ones are the absorbent part of the diaper and the cover combined into a single diaper, just like disposables. All-in-twos are similar, but the absorbent part snaps into the cover, so they can be separated for washing and drying.There are a multitude of independent diaper makers sewing both types of diapers. Similar to fitteds, makers usually give a range of fits based on weight. You’ll have to experiment to find the right fit for your baby. The only AIO I ever tried was called the All Together Deluxe AIO, but it doesn’t look like they are made any longer. They were trim, fit my kids well, held in runny poops, were relatively inexpensive, and easy enough for daycare providers and babysitters to use. They had snap closures, so there wasn’t any velcro to wear out, and they could take a real beating, unlike a lot of other AIO’s that need special care. I used the same size M ATD’s on Julia and then Isaac for years, and they still looked and performed like new. As my kids got bigger, I found that they weren’t absorbent enough, and switched to a wrap and prefold system that took them through potty-training. The advantage of AIO’s and AI2’s are their ease of use. Similar to fitteds, it can be hard to get AIO’s clean. It can also be difficult to decide how to wash them since the covers sometimes need delicate care but the absorbent parts might need some deep washing. AI2’s solve for that problem since you can separate the absorbent layers and the covers. Then the disadvantage is simply the time it takes to re-assemble them after washing and drying. Pocket diapers have a layer of fleece sewn to a cover (either fleece or PUL) with an opening in the back so that the inside of the diaper can be stuffed with an absorbent layer like prefolds, specially made stuffers, or even hand towels. Pocket diapers are sized similarly to fitteds and AIO’s — typically by weight. One of the biggest manufacturers of this style of diaper is Mother of Eden, which makes Fuzzi Bunz (FB). I used these at nighttime and I thought they were fantastic. I stuffed them with heaveyweight hemp flats. The fleece lining wicked moisture away from babies’ skin, leaving it dry to the touch. Pocket diapers as easy to put on a baby as disposables. The fleece lining keeps baby bottoms nice and dry. And there are lots of cute prints to choose from! It can take a bit of time to re-assemble pockets (i.e., stuff the inserts back in), and snaps, velcro and elastic can wear out over time. Pocket diapers can also be a little tricky to care for to ensure the fleece doesn’t get a build up that causes it to be water repellent. Covers are the water resistant layer that will go between the cloth diaper and your baby’s clothing. They won’t be needed if you’re using an All-in-One, All-in-Two or a pocket diaper. You also might not need a cover if you’re using a nice, plush fitted and are hanging out at home in warm weather. Pull-on – Dappi pull-ons, Bummis whisper pants and Aristocrats are examples of pull-on covers. Pull-ons have the advantage of being quick and easy to get onto a squirmy toddler (even if they’re standing up), but they have the drawbacks that they can only be used with fastened prefolds or fitted diapers. Also, if you’re unfortunate enough to get a poopy blowout in a pull-on cover, it can be pretty messy. One of the most common is polyurethane laminate (PUL). This is a polyester fabric with a waterproof coating applied to it. It’s trim and relatively leak-proof, but not that breathable. Bummis SIWW, Airflows, and Proraps are PUL. Waterproofed nylon is used in Dappi pull-ons, Bummis whisper pants, and Bumkins. This is the trimmest, and in my opinion, the most leak-proof material. However, it also not that breathable and takes a little TLC (it shouldn’t be washed in hot water and should be line-dried). Then there’s polyester fleece. Fleece can be very breathable (depending on what type it is. I believe it’s polar fleece, Windpro, Windbloc from most to least breathable). However, it’s pretty bulky and can wick moisture onto clothing if it’s compressed for a long period of time (like during a long car ride). Finally, there’s wool, which a lot of people consider to be the ultimate cover material. It’s natural, breathable, moisture-resistant, and anti-bacterial. Aristocrats, Sustainablebabyish, and Sloomb are examples of wool covers. I tried every style and material combination possible when I was diapering my children, and what I ended up using was PUL velcro wrap-style covers, either Bummis or Bumkins. They were the best combination of trimness, affordability, leak-proofness and ease-of-use for me. Doublers are used to add absorbency to your diapers. They’re a great solution for naptime and overnights if you don’t want to get a whole new diaper just for these heavier wetting situations. Doublers come in the same variety of materials as cloth diapers themselves. This includes, cotton, hemp, bamboo and microfiber. Each material has its advantages and disadvantages as far as naturalness, sustainability, durability and absorbency. I’ll go into those in detail in a separate post. Once I got the hang of cloth diapering, I didn’t find the need for doublers. I used prefolds during the day and thick hemp flats for night time, and the diapers themselves offered the absorbency I needed for any situation. 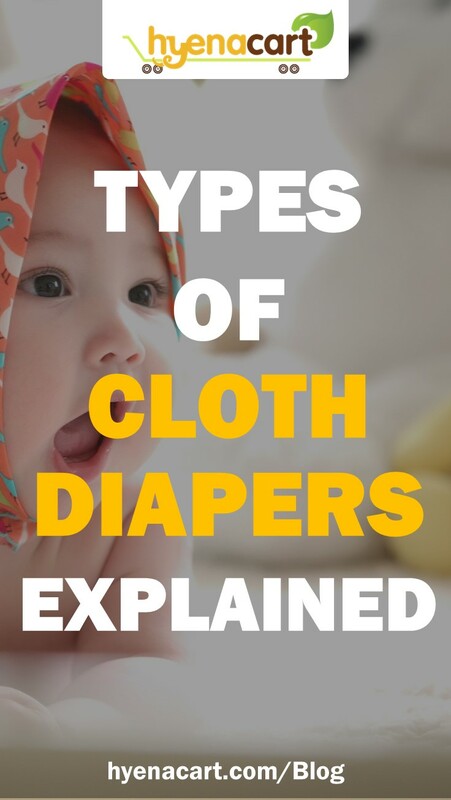 The advantage of fleece liners is that they keep your baby’s bottom drier than being directly against wet cotton, and poop tends to peel off of them. Also, if you do get a sticky poo, you can just swish the liner in the toilet rather than the whole diaper. You can also get flannel liners to get the easy swishability effect without the polyester (some babies are sensitive to polyester, and some moms are purists about not using synthetic fibers), or you can buy flushable liners that you just take out and flush. I used fleece liners for a while, but eventually stopped using them to simplify my system. I found that my daughter actually had more rashes when I used fleece liners and that poop peeled pretty easily off of her prefolds. If she had a particularly squidgy mess, I just threw it in the bin and let the washing machine worry about it. Some people find this gross and either dunk their dipes or install a sprayer on their toilet that can be used to hose of the offensive matter. It’s all up to you. Also, for what it’s worth, I found that when my toddler had been eating well (i.e., a lot of whole grains, fruits and vegetables) her BM’s were very well-formed and easy to dump.